The John Munnelly 'laughjohnlaugh' bands New Year performance with a full acoustic and vocal show. Hear the Christmas song that was described by recent press and radio as "grin inducing" "Beatlesque" and "a highlight"
Laughjohnlaugh Band is led by the ASCAP award winning songwriter known for his entertaining live show. This new year show turns on the full '1960's coffee shop in the Village' treatment with choice covers and 'grin inducing' originals. Path Cafe has established itself as the intimate welcoming venue for a relaxing live experience with good food selection. Cafe hosted by the ever friendly and genial David with wines, beers and hot drinks. 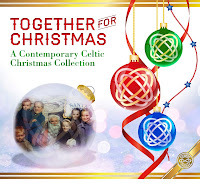 "Together for Christmas - A Contemporary Celtic Christmas Collection." CHRISTMAS Shows in Brooklyn and 'The City' I can hardly believe it is Christmas nearly already, we have three performances coming up each with a different flavor. Be an early adopter and tell your kids and friends where you heard a future yule classic - "Happy Christmas " being performed. Oh yes and get something to play at your Christmas party that has fun stamped all over it. Remember the craic of Christmas party in Ireland - it's on Together for Christmas: a Contemporary Celtic Christmas Collection out now on iTunes, Amazon CDBaby and by phone. What: 72nd Annual FTCC Vespers. John Munnelly & the Silent Note Choir with Genna Johnson perform a ding-dong version of Happy Christmas, we play the Happy Christmas song from the new Celtic CD live with a youthful and vibrant choir called the "Silent Note"